I finished crocheting the red granny ripple blanket which was my previous ‘use what you have’ project, pictures will follow sometime soon. 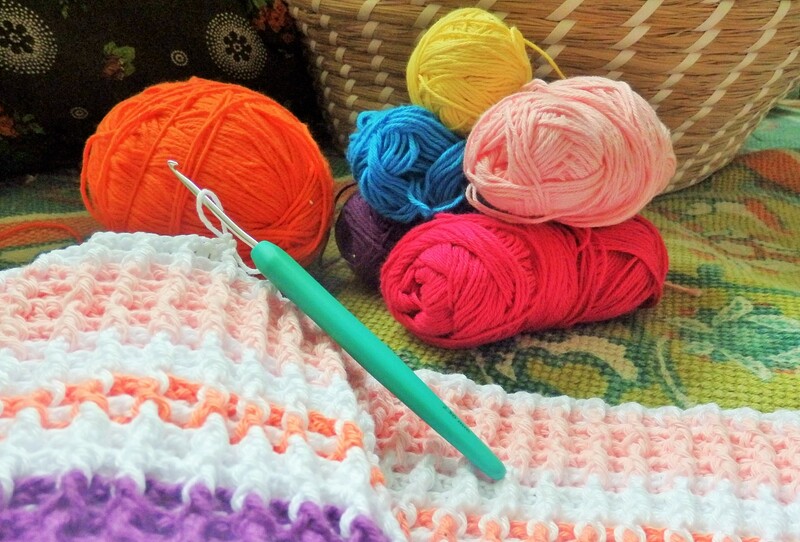 Since I love making blankets, I soon started a new project. This time I am cheeting a little. All colours are leftovers from myself and others, but I needed something to bring it all together, so I bought some white yarn for this project. I like the bright colours, and the pattern I choose. I don’t know whether there’s a name for this stitch, it’s something I made up along the way but I am really happy with it. The blanket seems twice as thick and is very stretchy…perfect for wrapping around little babies! Perhaps later on I can write a little tutorial?